Thank you all for another fruitful season! The Entire Farm is closed for the winter, we will reopen in the spring for strawberry picking, see you then! Please check our Picking Conditions page for daily picking information before visiting. Information on how to handle your peaches and lots of great fruit and recipes. 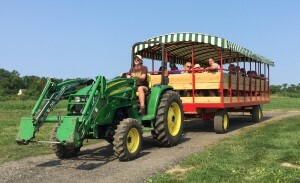 Our barnyard, playground, and farm kitchen are family friendly activities all will enjoy. After apple picking, come visit the barnyard to see the goats climb their mountain of stone and then enjoy farm fresh homemade baked goods, ice cream, and apple cider donuts at the Tougas Farm Kitchen. Fun for the whole day, a perfect Massachusetts vacation & New England experience. Strawberries are ready in June, but do you know when our Honeycrisp™ apples are ripe for picking? Check out our fruit seasons page and join our mailing list to see when our fruit crops are ready for you to come out to the farm to pick. Please observe all rules for the benefit of all of our customers and our farm Always check in at the PYO shed first to get picking locations and information. Please pick only in designated areas, which are carefully selected based on the ripening schedule of our fruit. We provide picking containers for a small fee or you may bring your own, just have it weighed at our check-in before entering the field. Wear appropriate clothing for the weather, don’t forget hats, sunscreen, and a bottle of water! We recommend wearing close-toed shoes good for walking on uneven ground, as bees, hornets and yellow jackets may be present on fallen fruit. If you drop any fruit on the ground, we ask that you please make every effort to pick it up and purchase it so that no fruit is wasted. Many labor-intensive hours go into the care of our crops. Children must be accompanied by an adult, and must stay within arms reach at all times. Please dispose of trash in proper receptacles Please be considerate of all of our customers and observe our non-smoking policy. Pets are not allowed on the farm due to health regulations See our Recipe Book for more handling, processing, and peach and apple recipes! CLOSED FOR THE WINTER, THANK YOU FOR A GREAT SEASON! Always check back for picking updates before visiting!